Explore stunning Kvarner Bay islands and Zadar. Spend your mornings admiring the spectacular scenery, enjoying swimming in crystal clear Adriatic sea and your afternoons and evenings exploring old historical towns or having fun till morning hours. 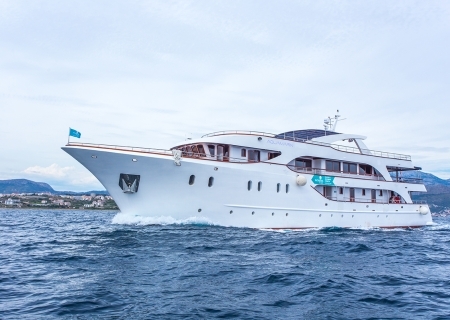 Small ship cruises along the charming Croatian coastline and islands on the brand new lavishly designed, fully air-conditioned vessel Infinity with spacious en-suite cabins. One way itinerary from Dubrovnik to Split includes exciting gastronomic and sightseeing experiences with guaranteed departures (May – October) and visits to Dubrovnik, Ston, Mljet, Korčula, Vis, Hvar and Split. 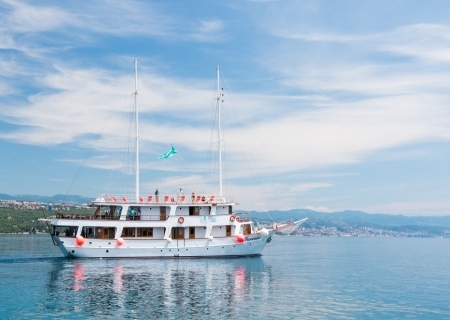 Small ship cruises along the charming Croatian coastline and islands on the new and lavishly designed, fully air-conditioned vessels with spacious en-suite cabins. Itinerary includes exciting gastronomical and sightseeing experiences with guaranteed weekly departures (May – October) and visits to Split, Korčula, Mljet, Dubrovnik, Trstenik, Hvar and Bol. Mljet national park, Authentic Croatian Village party, Spectacular evening dinner cruise along the old town city walls of Dubrovnik, swimming at Golden Horn beach on Brač island. Connect your puzzles with this one way departure and explore the stunning Dalmatian coastline and islands. Spend your mornings admiring the spectacular scenery, enjoying swimming in crystal clear Adriatic sea and your afternoons and evenings exploring old historical towns or having fun till morning hours. This route departing from Split and ending in Dubrovnik offers an unique 7 night experience of Croatia from the sea. Terms and Conditions apply to all sailings. Contact Enjoy Vacationing for more details! Gear up for endless new discoveries no matter what your speed onboard the cruise line voted Best Overall 16 years running. When you book now, you’ll score up to $100 to spend at sea — and that’s just the beginning. BOGO60 — 60% off second guest, plus 30% off third and fourth guests. *Cruise must be booked between February 1 – 28, 2019 (“Offer Period”). Offer applies to sailings departing on or after March 1, 2019. “BOGO” provides 60% off cruise fare of second guest booked in the same stateroom as first full-fare paying guest, and 30% off cruise fare for third guests and higher booked in the same stateroom as the first two qualified guests. In addition, BOGO offers up to $100 to spend at sea (“OBC”) per stateroom determined by category booked and sailing length: On sailings 5 nights or less, $25 OBC for Interior and Ocean View, $25 for Balconies and $50 for Suites; on sailing 6 nights or longer, $50 OBC for Interior and Ocean View, $75 for Balconies and $100 for Suites. Kids Sail Free: provides free cruise fare for 3rd guests and higher who are 12 years old or younger on 4-night or longer Alaska, Bahamas, Bermuda, Canada, Caribbean, CaribNE, Coastal, Cuba, Europe and Hawaii sailings departing between March 1 – December 15, 2019. Offer excludes Spring Break sailings (Sailings between March 16 – 30, 2019), Holy Week/Easter sailings (Sailings between April 13 – 22, 2019) Summer sailings (Sailings between May 15 – August 31, 2019) and 2019 Thanksgiving sailings (Sailings between November 23 – 30, 2019). NRDB cancelled prior to final payment due date will receive a future cruise credit in the amount of the deposit minus a 100USD/CAD per person service fee (“FCC”). FCC is non-transferable and expires after 12-months from issue date. 100USD/CAD per person service fee applies to changes to NRDB ship or sail date. Deposits made toward Guarantees and Grand Suites and higher categories are non-refundable and are subject to NRD Booking Terms. Combinability: BOGO and Kids Sail Free are combinable with each other as well as with promotional OBCs, NextCruise offers, Instant Savings, restricted discounts (for example, Seniors, Residents, Military), Promo Code driven offers, Free Upgrades, Crown and Anchor discounts and Shareholder Benefits. Offers are not combinable with any other offer or promotion, including, but not limited to, Standard Group, Interline, Travel Agent, Travel Agent Friends and Family, Weekly Sales Events, Net Rates. Promo Code driven offers are based on select ships and sail dates and must be applied at time of booking, limit one promo code per booking. General Terms: Instant savings amount shown in USD and will be converted to currency used for cruise purchase. Instant savings do not apply to China departures. Savings applied to cruise fare at checkout. All other charges, including, but not limited to, taxes, fees and port expenses, are additional and apply to all guests. After the Offer Period, the offer will be removed from the booking if the guest cancels and reinstates the booking or rebooks into a new booking on the same ship and sail date, applies a fare change, or changes the ship or sail date of the booking; certain other changes to the booking may also result in removal of the offer. Offer applies to new, individual and named group bookings confirmed at prevailing rates. Individual reservations may be transferred into an existing group, assuming required criteria are met; full deposit will be required at time of transfer. Failure to apply the required full deposit amount may result in the cancellation of the booking. Single occupancy guests paying 200% cruise fare are eligible for full amount of offer; single occupancy guests paying less than 200% cruise fare are eligible for a prorated amount of the offer. Offer available to residents of United States, Canada, Puerto Rico, and select countries in the Caribbean. Prices and offers are subject to availability and change without notice, capacity controlled, and may be withdrawn at any time. Refer to www.RoyalCaribbean.com for complete terms and conditions. Royal Caribbean International reserves the right to correct any errors, inaccuracies or omissions and to change or update fares, fees and surcharges at any time without prior notice. ©2019 Royal Caribbean Cruises Ltd. Ships’ registry: Bahamas. Check more firsts off your bucket list with incredible savings for the whole family — like 50% off your second guest. Bring the whole crew, because right now kids sail for less*. And the savings don’t end there. FALL & WINTER SAILINGS — Your clients can save up to $50 on select fall and winter sailings when they use the promo code SAVE*. SAIL INTO THE HOLIDAYS — They can save up to $150 extra on holiday sailings. EARLY BOOKING BONUS — They’ll also score up to $100 to spend at sea on sailings booked 6+ months in advance with our Non-Refundable Deposit program. This is not a cruise. This is a sun-soaked island getaway for the whole family. Swim with sea turtles at Turtle Cove in St. Thomas. Snorkel Watermelon Cay in St. John. All while sailing on ships as incredible as the destinations you visit. When you book now, you'll save 50% on your second guest. And bring the whole crew, because kids sail free on select sailings. Come Seek the Royal Caribbean®. Save big on your next sun-soaked island getaway. When you book now, you'll save 50% on your second guest — and that’s not all. BOGO50 — Buy one guest, get the second at 50% off. KIDS SAIL FREE — Kids age 12 and under sail free on select sailings. MORE WAYS TO SAVE — 25% off third and fourth guests. EARLY SAVINGS — Score up to $100 to spend at sea when booking early. Offer details:  Guests 12 & Under Sail Free. Buy one guest, and get second guest at 50% off! Even more savings — Third and fourth guests sail for 25% off. Deck the Holidays — Score up to $150 in onboard credit on holiday sailings. Plus, if the booking is for more than 6 months to sailing, you will receive up to $100 OBC as an Early Booking Bonus! This offer applies to sailings departing on or after October 1, 2017, with the exception of China departures. Deck the Holidays Deals receive additional onboard credit when booking holiday sailings departing 12/19/17 through 12/31/17 and 12/18/18 through 12/31/18. 5 nights or less Inside/Ocean view: $25 per stateroom Balcony/Suite: $50 per stateroom 6 nights or more Inside/Ocean view: $50 per stateroom Balcony: $100 per stateroom Suites: $150 per stateroom The Early Booking Bonus of up to $100 OBC per stateroom will be applied to Non-Refundable Deposit Bookings that are booked six months or more prior to the cruise departure date. You’ll have the chance to put big smiles on your face with terrific rates on Princess Getaways, ideal for couples and families needing a short vacation, up to five days. Book destinations that include the Caribbean, Mexico, Canada & New England and the Pacific Coast, sailing fall 2017 through spring 2018. †Buy 1st Guest Fare, Get 2nd Guest Fare at 50% off offer is based on first guest at 100% fare, and second guest at 50% fare in same stateroom. Savings is based on a per guest discount off applicable Launch Fares on a space-available basis at time of booking on select sailings. Launch Fares are offering fares and may not have been in effect for the past 90 days or resulted in actual sales in all categories. Intermediate discounts may have been taken and fares may remain at discounted levels after this promotion. First and second guest fares apply to minimum lead in categories on a space-available basis at time of booking. Fares for other categories may vary. Fares are per guest, non-air, cruise-only, based on double occupancy and apply to the first two guests in a stateroom. These fares do not apply to singles or third/fourth-berth guests. **3rd & 4th guest fares from $99 per guest apply to the 3rd or 4th guests booked in the same stateroom as the first and second guests. Fares apply to minimum lead-in categories on a space-available basis at time of booking. Fares for other dates and categories may vary. Fares quoted in U.S. dollars. Deposit of $50 per guest made under Great Getaways are non-refundable. Offer is not transferable and is available to residents of the 50 United States, Canada, Puerto Rico, Mexico, Bermuda and the District of Columbia who are 21 years of age or older and receive this offer. This offer has limited space regardless of stateroom availability. Please refer to princess.com/sale for terms, conditions and definitions that apply to all bookings. Offer valid: May 16 - June 15, 2017. Our first-ever BOGOHO Plus offer is here, and with it come great savings, the chance to visit destinations you’ve been dreaming of, and free internet while onboard. Book a voyage between December 12, 2016, and March 31, 2017, and receive 50% OFF THE CRUISE FARE OF THE SECOND GUEST FREE INTERNET when booking a Club Oceanview or higher stateroom. That’s 50% savings on your second guest and unlimited connectivity all voyage long. Because a vacation never happened unless you share it on Facebook. *2-FOR-1 offer means 1st guest in double-occupancy stateroom pays full cruise fare and 2nd guest in the same double-occupancy stateroom pays no cruise fare. Offer is not valid on category LS. Offer is only valid on the following American Empress 2017 voyages: 3/19 and 3/26. Offer is valid until December 5, 2016 or when no qualifying cabins are available. Offers are only valid on new, paid-in-full bookings. Full payment at time of booking is required to redeem these offers and cabins will not be held without full payment. Offers open to U.S. and Canada residents only. Offers are based on cabin availability and only while inventory lasts. Not valid on Group bookings or existing reservations; cannot be combined with other promotions or discounts. Promotional fares and amenities are capacity controlled, may vary by sailing and may be withdrawn without notice. Cruise fare does not include government taxes and fees, port charges, gratuities, airfare, insurance, personal expenditures, and transportation costs incurred while traveling to and from embarkation ports. Not responsible for errors or omissions. Additional terms and conditions may apply - call for details. This is not a cruise. This is a sea of savings on adrenaline amplifying adventures. Take an airboat ride through unspoiled marsh in Belize and caravan through Costa Maya on an ATV. Hop from shore to shore onboard ships with exciting thrills of their own. And right now, you'll save 60% off a 2nd guest, plus 30% off 3rd and 4th guests! This is not the Caribbean. This is the Royal Caribbean®. Hurry! Offer ends November 2, 2016! Cruise must be booked October 1 through November 2, 2016 ("Offer Period"). Offer applies to sailings on or after November 1, 2016. Offer excludes China departures. Offer includes 60% off cruise fare of second guest booked in the same stateroom as first full fare guest. Offer also includes 30% cruise fare savings for 3rd and 4th guests booked in the same stateroom as first two qualifying guests. Also, offer provides for free upgrade from ocean view to balcony on offer eligible Anthem of the Seas sailings. Free upgrade refers to booking a balcony stateroom for an ocean view stateroom at standard/full fare. Additionally, bookings made October 1 - 11, 2016 for eligible Bahamas and Caribbean holiday sailings, offer includes a per stateroom onboard credit ("OBC") based on sailing length: $100 OBC per stateroom for holiday sailings 3 - 5 nights departing December 22 - 31, 2016 and 2017, $100 OBC per stateroom for holiday sailings 6 - 9 nights departing December 15 - 31, 2016 and 2017, and $200 OBC per stateroom for holiday sailings 10 nights or longer departing December 15 - 31, 2016 and 2017. All other charges, including, but not limited to, taxes, fees and port expenses, are additional and apply to all guests. BOGO60 is combinable with 3rd and 4th Guest Savings, Anthem Free Upgrade, Holiday OBC, Crown Anchor discounts and NextCruise offers. BOGO60 and 3rd and 4th Guest Savings are not combinable with restricted rates. Anthem Upgrade and Holiday OBC are combinable with restricted rates and NextCruise offers. Anthem Upgrade is combinable with Crown & Anchor discounts. Holiday OBC is not combinable Crown & Anchor discounts. All offers are not combinable with any other offer or promotion. Offer applies to new, individual and named group bookings confirmed at prevailing rates. OBC is in U.S. dollars, is not redeemable for cash, and will expire if not used by the last evening of the cruise. Offer open to residents of U.S. or Canada. Prices and Offer are subject to availability and change without notice, capacity controlled, and may be withdrawn at any time. This is not a cruise. This is a bright new adventure – any time of year. Go boogie boarding in Basseterre and ride horseback along Chukka Beach in Jamaica. Explore brilliant new shores while island hopping onboard the most awe-inspiring ships in the world. And save big with 50% off second guest and bonus savings on your third and fourth guests. This is not the Caribbean. This is the Royal Caribbean®. Sailing Window: All sailings departing on or after August 7, 2016. Offer excludes China departures. This is not a cruise. This is surf, sun and summer thrills. It's racing the tide in Tortola's Virgin Gorda Baths and tasting coconut-crusted wahoo at a beachfront shack in Roatan. Hopping from shore to sun-soaked shore onboard ships that are destinations all their own. And saving big with BOGO Saver. This is not the Caribbean. This is the Royal Caribbean. Sailing Window: All sailings on or after May 5, 2016, excluding China departures. Buy One Guest, Get Second Guest 50% Off. 25% off for 3rd and 4th guests. BONUS – Pre-paid gratuities in Oceanview categories and above for the first and second guests on all products excluding Alaska, Asia, China, Transatlantic and Repositioning sailings. PLUS for eligible new deployment sailings departing on or after May 1, 2017 (excluding China departures), offer includes Free Upgrades within stateroom type.